Would spell his fate until again he quaffed. Er. Anyway, I believe that as Christmas nears, I can justify occasional consumption of something interesting. Plus, it's not truly a festive occasion without the risk of retching, is it? Today, we at the Lab will be trying another find of the Kibbitzer-in-Chief's: Fentiman's Full Bodied Shandy. You may remember how successful some of her other finds have been. I'm sure I needn't remind anyone that the two most hideous things we have ever consumed here--the Biotta Digestive Drink and the Abali Yogurt Soda--were both K-i-C acquisitions. In any case, we've had Fentiman's before. One of the first things I reviewed was their Dandelion and Burdock soda (one of the rare weed-flavored Weird Soda variants). This one is a Shandy, which is apparently beer flavored with lemonade or ginger ale. However, this bottle specifies that, while it is made with traditionally brewed beer, it contains very little alcohol. Like the other Fentiman's, the label says "Best Before: See Neck", but the neck bears no indication of an expiration date. It occurs to me that it does not specify the neck of the bottle. Perhaps some other neck? Upon inspection in the mirror, my own bears no such inscription. Perhaps it is borne within the shandy itself, in some sort of rod-logic-containing nanotechnological system. After consuming it, the nanosites will migrate to my neck and form a subcutaneous organic LED display, which will read "It's expired. You're gonna die." Oh, what the heck. Take me to Shandy-town! Where and when: I have no idea where she finds these things, but it came to the Lab in December 2009. Color: A fairly rich yellow-orange, like a nice apple juice. Scent: Quite pleasant, actually. Lemonade-ish, with just a hint of creamy bite. Okay, this is a complicated one. The initial taste is tart and lemony, followed quickly--a few seconds--by a growing nuttiness, which must be the beer. This is underlaid by an interesting combination of tart and bitter/creamy. It's pretty similar to some of the lighter beers I've tried--wheaty, crisp, citrusy. 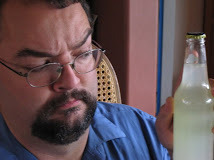 The lemonade is mostly in the initial taste, then hides around the edges. Actually, it's very good. Let's see what the young'uns think. Lead Assistant Taster: "Smells nice, kind of like a cross between root beer and apple cider. *quaffs* Sweet, but the aftertaste is kind of bitter. And the aftertaste rolls along with the taste." Junior Assistant Taster: "Uuh. Doesn't smell that good. *quaffs* Doesn't have much taste." LAT: "The aftertaste is like grapefruit!" I'm honestly quite surprised that they liked it as much as they thought. Me: "You know, this has beer in it." LAT: "Actually, that's not that bad, is it, then?" JAT: "That's what beer tastes like?" *runs back to the backyard, faintly overheard* "I guess I wouldn't mind trying beer sometime." Cough rating: 0.5. The nuttiness would be off-putting, if you didn't like beer.